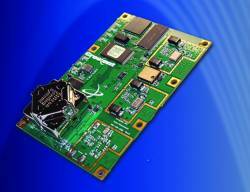 Hemisphere GPS has released its Eclipse L1/L2 GPS OEM receiver module and evaluation kit. The 24-channel Eclipse technology delivers dual-frequency solutions (L1 (CA), L1 (P), L2 (P) with carrier phase signal tracking) with a 20 Hz maximum update rate. The unit incorporates Hemisphere GPS’s exclusive techniques for reducing code measurement noise and mitigating multipath signals. Hemisphere GPS has released its Eclipse L1/L2 GPS OEM receiver module and evaluation kit. The 24-channel Eclipse technology delivers dual-frequency solutions (L1 (CA), L1 (P), L2 (P) with carrier phase signal tracking) with a 20 Hz maximum update rate. The unit incorporates Hemisphere GPS’s exclusive techniques for reducing code measurement noise and mitigating multipath signals. Designed for a wide range of applications, Eclipse technology supports a variety of differential GPS solutions — including real-time kinematic (RTK), OmniSTAR (HP and XP) and satellite-based augmentation systems (wuch as WAAS and EGNOS). Integration is simplified with multiple serial and USB ports and upgradeable firmware for establishing the desired configuration and quick access to new features. Hemisphere GPS, Calgary, Alberta, Canada.